The following instructions describe the way I build a digital negative for Van Dyke Browns. Aside from creating a useful digital negative, the organization of my file and the sequence of steps I take to produce it are intended to provide some additional benefits. The file records more of the image's history than the history palette does. The file structure permit backups and restores to any point in the image's evolution. The following figure shows the Layer palette for a typical Van Dyke Brown negative. By default Photoshop layers are added on top of one another. The layer stack grows from the bottom up, and the first layer is usually called the Background layer. The original scan of the image should be put on, or directly above the Background layer. Levels are best set at the scanner. My scanner software does not permit this, so the first thing I do is set the white point and the black point of the image not the 5% and 95% point Dan talks about in his book. This initial setting is just for the computer's sake. It ensures that the internal arithmetic representation of the tones use all the numbers that are available. Don't worry about how the image looks at this point and DO NOT use the automatic level set for this purpose. The following image shows the level setting for the example image. Note that the sliders are set at the edges of the curve. If either slider is set outside the limits of the curve, some of the computer's tonal values will be assigned to tones that do not exist. The remaining tones must then share what is left over. To preserve the initial state of the scan, copy the bottom image layer and paste it into a new one. Name it Retouching and use it for spotting out dust and scratches. If you will need curves, masks or other alterations to get a good inkjet print, copy the Retouching layer and paste it into a third image layer. 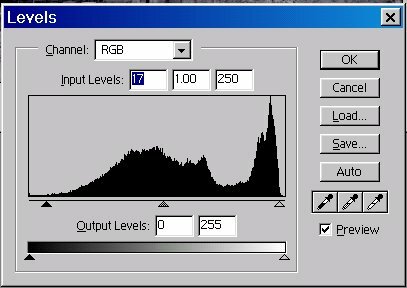 Work your creative magic on this layer - that way you cannot harm your carefully retouched original scan. The layer above (Artistic Liscense) indicates the location of additional layers used in creating the final image. Print the finished image on photo quality glossy paper using the same printer you will use to make the digital negative. Adjust and repeat until satisfied. Once you've got a good inkjet print you know that you can print a negative that will produce the desired results. Make a merged copy (Select > All - Edit > Copy Merged) of all the layers and paste it into the picture. Name the new layer negative. Invert (Image > Adjust > Invert) this layer. This layer is your working negative. Hide all the other layers if you like. Load the Van Dyke Brown curve into a new Adjustment layer above the Negative layer. Name this layer so that you know it is the Van Dyke Brown curve. The following figure shows the Van Dyke Brown curve I used to print the sample image. The data points (represented as small squares on the curve) are included here. Flip the Image horizontally if you have not included this setting in a custom printing mode you have created for digital negatives. The ink pad in most overhead transparency materials disperse light somewhat and slightly blur the image if you try to print through them. Print the image on Pictorico OHP using the Custom Printer settings you saved when you calibrated your printer. Use the digital negative as you would any negative to expose the sensitized Van Dyke Brown paper. If you are unhappy with the contrast or want to make other adjustments, adjust the correction curve on the negative layer, reprint the digital negative and then make another Van Dyke Brown.